A vacation can be a trip, in the same sense as a “trip” with the help of a sacred herb, medicine or drink, if you treat it as such. A vacation can take you out of your regular world and into an altered state, if you allow your personal membrane to be open to what is around you so it can permeate and mix with what is within you. It is with that membrane open, that I entered into the Yucatan Peninsula. On the plane ride to Cancun, I saw a rainbow in the clouds below me. That is a perspective from which I had never expected to see a rainbow and I wondered how stories of rainbows would be different if we always saw them from that perspective. I also wondered if it were Ixchel, Lady of the Rainbows, acknowledging that I was coming to make an offering to Her from myself and my Sister. Lady of the Rainbow is just one name for Ixchel, the Mayan Goddess of moon, fertility, childbirth, medicine and weaving. Most goddesses have a variety of names seemingly due to their multiple “jobs” due to the learnings, needs and locations of their worshippers. Ixchel, also thought to be Goddess O in the Dresden Codex, is also know as the White Goddess, Red Goddess, Evening Star and She of the Pale Face. It is not surprising to me she is associated with both colors white and red as the moon has many phases and white tends to be mentioned with the young goddess (waxing moon) and red with the old grandmother (waning moon). 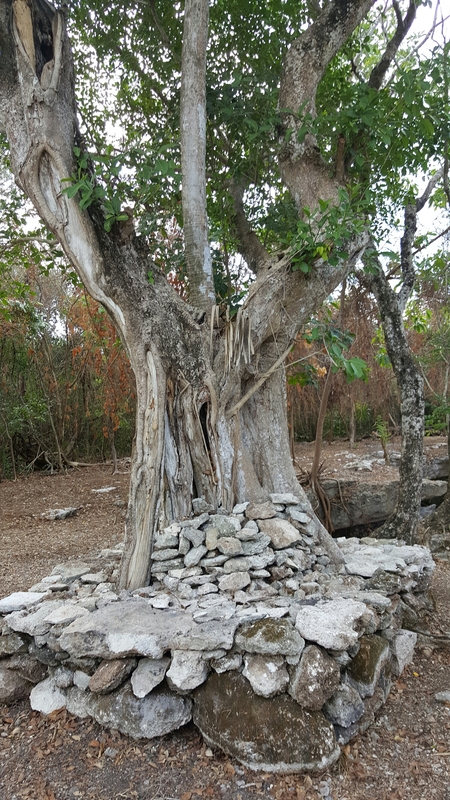 San Gervasio on Cozumel is known as the hub of worship for Ixchel and many pilgrims travelled there to ask for Her blessings of fertility. Cozumel was known as Tantun Cuzamil in pre-Columbian times, which is Mayan for Flat Rock in the place of the Swallows. I was greeted by many swallows at the island after the 40 minute ferry ride from Playa del Carmen. 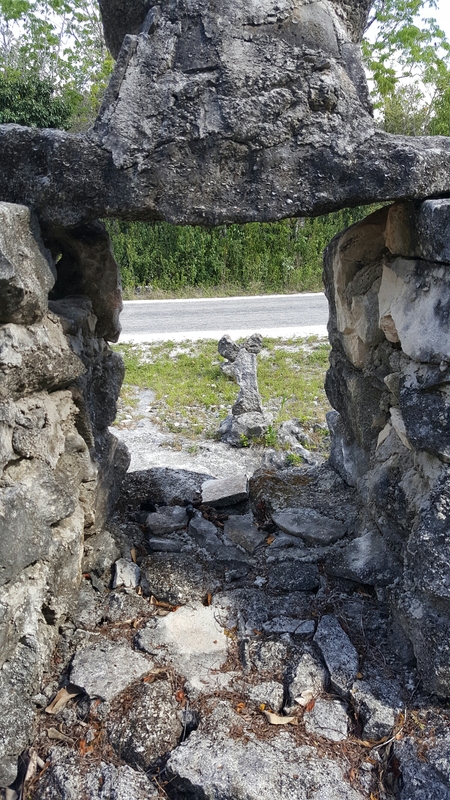 Upon beginning the drive down the long entrance road to San Gervasio from the main island road, there was a cenote on the side of the road and my husband and I decided to stop and take a peek. 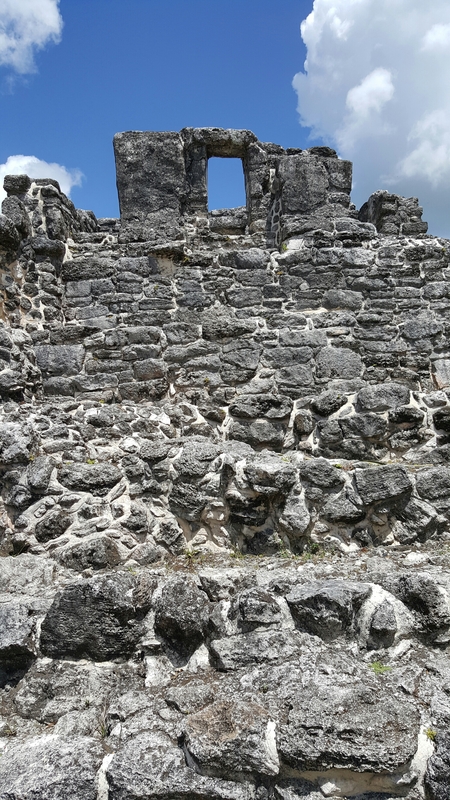 A curved stone wall brought a welcome feel as it seems to pull you down and into the cenote while at the same time denoting a sacred place. It certainly was a sacred place as what was at the bottom of the cenote gathering materials from the fertile water’s edge, but honey bees! A perfect welcome from the fertility Goddess as who brings more fertility to the land than the honey bees?! My head is abuzz with ancestors’ whispers as I lightly step upon the path that snakes its way to you. They walk with me now, each step that I take, a pilgrimage of the Heart. Five beating hearts, though one must be awakened; the fruits of your labor run deep. I hear the words of the guide, a veil once again, and push through until I hear your Voice. You are not afraid, or weakened at all, but waiting patiently for your Daughters to step up. The threshold is crossed and creation occurs; what unfurls now is known only by my buzzing Heart Stirs. I know that you are pleased by the smile you leave over a pile of stones from the past. Thank you Tinah Bee! You inspire me! The bees are so skilled at connecting people through their hearts! So happy to hear that these experiences have stirred something in you. I found the magic to be very strong here! If you want to talk, just send a message! Either way, blessings on your path. May the rainbow smile upon you always!